For any motorcycle project – rebuild, restoration, or a simple tune-up – it’s a good idea to start with a plan. A plan is especially important when it comes to motorcycle engine rebuilds. You should plan your build long before the engine is ever split or you may find yourself tearing everything down to do it all over again if you missed something the first time. Give the bike a full tune up and get it running well. Do a top end rebuild. Split the cases and do a full engine rebuild. Those motorcycle engine rebuilds and tune ups are listed from cheapest to most expensive. Now, if you bought a bike that has been sitting halfway taken apart with the engine partly dismantled, you’re probably looking at some form of a full engine rebuild – at the very least to inspect everything before it’s all buttoned up. Before you make your final decision, you should try to price everything out. You may find the cost of the rebuild you’re looking at will add up to more than the entire bike is worth once you’re finished. Using the general motorcycle engine rebuild and tune-up checklists below, go research the cost of new and replacement parts for your bike. That should give you a better idea of which option is best for you. Be sure to get your measuring tools out – if you can reuse parts that are within their serviceable limits, you’ll be able to save some money. Most motorcycle projects should start with a full tune-up to get it running if you’re able to. This way, you’ll be able to decide whether a full engine or top end rebuild or restoration is even necessary. You probably don’t want to rebuild an engine if the motorcycle runs perfectly fine. Adjust points and time engine. Replace spark plugs and set plug gap. Inspect wires and electronic connections. Clean or replace air cleaner. Lubricate grease fittings with grease gun (i.e. swing arm). Adjust brake cables and levers. Adjust and lubricate drive chain. Check or replace brake fluid. Check tires and tubes, replace if damaged or old. Check spokes for damage and tightness. A full tune up will make sure everything is within the specifications it should be in to run correctly. Sometimes, a tune up is all it takes to get rid of issues on a bike that has been sitting for a long time. Checking cam chain guides and adjusters, replacing if necessary. Inspect valves, valve springs, and valves seats, cut/replace if necessary. New oversized pistons, rings, pins, and clips. Even that short list for a top end rebuild can get expensive. 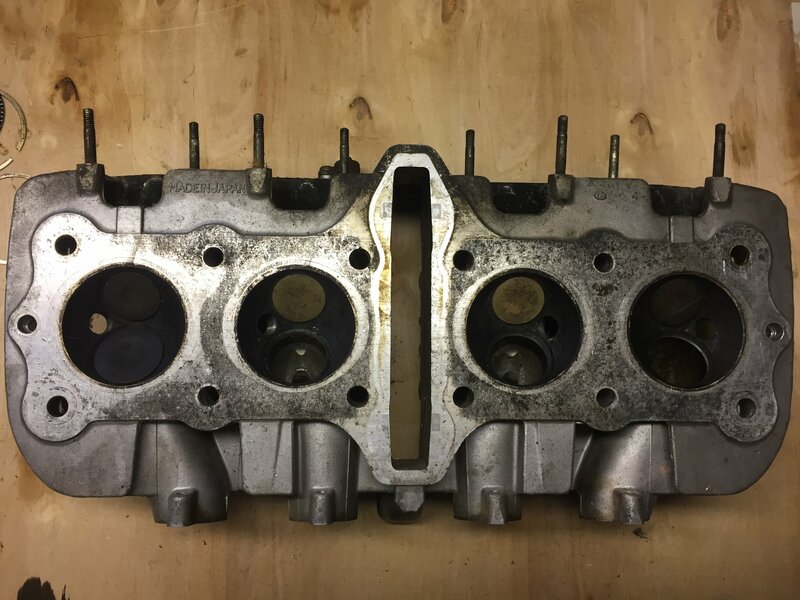 If you’re going to take the engine apart completely to do a full rebuild, you’ll definitely want to inspect everything and replace anything that’s worn, damaged, or out of serviceable limits. Inspecting gears, gear dogs, shifter forks, bearings, shafts – replacing if damaged or worn. Inspect the rod bearings and rod – replacing in damaged or worn. Inspect the primary chain – replacing if worn or stretched. Replace all seals, o-rings, and circlips. While you have the engine apart, be sure to keep track of the installation and removal sequence for everything. Take good notes and pictures to make sure you’re able to get everything back together. Take the time to clean all the parts and cases and use assembly lube as necessary as you put things back.